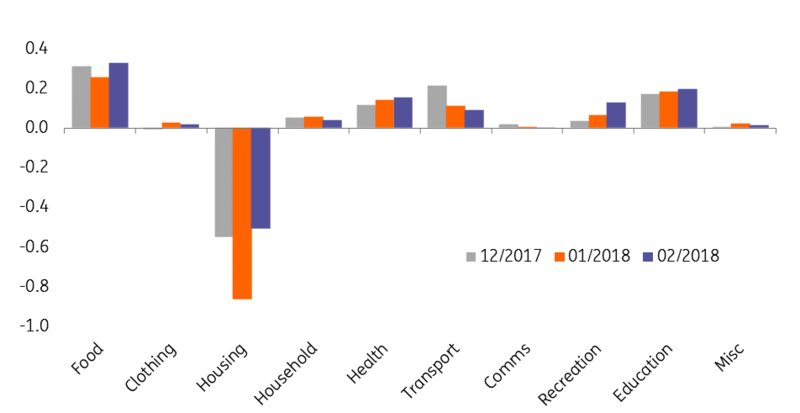 We're not too excited by this stronger than expected inflation rise - much of it looks transitory - moreover, we're axing our MAS tightening call. Singapore's February inflation rose a bit more than expected, with the headline rate now 0.5% (was zero in Jan 2018) and the MAS (Monetary Authority of Singapore) core measure (strips out housing) rising from 1.5 to 1.7%YoY. There is no strict inflation target for Singapore, though acceptable rates would likely be in the 2-3% area. So the headline looks way off, while the core looks to be closing in on a rate that would be just about right. If you take a look at narrower subcomponents of the inflation series, the overshoot of consensus looks less impressive. But most of the pick up in the YoY headline rate comes food, which is fickle, volatile and not a particularly good guide to domestic demand strength. In addition this month, there is a boost from recreation - in particular holidays. These were no doubt lifted by higher prices for holidays during the Lunar New Year. As such, this should drop back again in March as the holidays' end, so the positive contribution will become a negative one. and core and likely also headline inflation should drop back. Approaching a level that looks broadly acceptable. So although this February CPI improvement ought to make us a little more comfortable in our forecast for a very modest tightening by the MAS stance at their April meeting, the likely transitory nature of some of this month's rises don't comfort us much at all.